The impact of this fire differed significantly from the 1869 blaze in two ways. The first was its size; the 1878 fire destroyed a much greater area — over 35 acres. The second major difference was that the earlier blaze occurred in the midst of the railroad economic boom. Plenty of investors were eager to rebuild before the arrival of the next summer season. The 1878 fire took place at the end of a boom period; the resort and nation were still emerging from the 1873 depression. To make matters worse, Cape May’s competitors had grown in number and success, and the Queen of the Seaside Resorts’ crown was tarnished. The writing was on the wall; Cape May was losing the war for Philadelphia dollars with Atlantic City. A sweltering day in the Quaker City caused so many Philadelphians to seek the relief of Atlantic City that the railroads, in an effort to accommodate the masses, would press into service boxcars with makeshift benches. Stephen Decatur Button was sixty-five years old in 1878. He had established himself as a leading architect in the decade preceding the Civil War, and had spent several years designing homes for the wealthy in Florida, Georgia and Alabama. Button had won the commission to design the Alabama Capitol building in 1847 and produced a building typical of the early American Greek revival style. He later moved to Philadelphia, where his contacts with the railroad eventually led him to Cape May. Button first commission in Cape May was to modernize the Columbia House in 1863 for West Jersey Railroad executive John C. Bullitt. During the next decade he designed numerous cottages and hotels in Cape May and the wooden summer city by the sea fell in love with his classical style. Amusement rides such as the Epicycloidal Swing (1879) and later the Ferris Wheel (1892) attracted the young in droves. The first Easter Parade was held in Atlantic City on April 16, 1876 and proved an immense success. 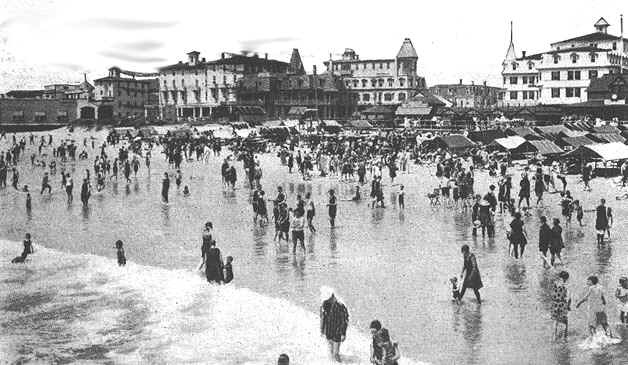 Though it had been so earlier, Cape May was no longer considered a serious contender of Newport, Rhode Island for the nation’s leisure class trade. By 1874 there were over 500 cottages and villas in the New England resort. In 1878, the year of the fire, there were as many Philadelphians summering in Newport as in Cape May.The writing was on the wall; Cape May was losing the war for Philadelphia dollars with Atlantic City. A sweltering day in the Quaker City caused so many Philadelphians to seek the relief of Atlantic City that the railroads, in an effort to accommodate the masses, would press into service boxcars with makeshift benches. A short article in the Cape May Wave on December 7, 1878 gave a clue to the direction Cape May was to take after the fire. Stephen Decatur Button was sixty-five years old in 1878. He had established himself as a leading architect in the decade preceding the Civil War, and had spent several years designing homes for the wealthy in Florida, Georgia and Alabama. Button had won the commission to design the Alabama Capitol building in 1847 and produced a building typical of the early American Greek revival style. He later moved to Philadelphia, where his contacts with the railroad eventually led him to Cape May. Button first commission in Cape May was to modernize the Columbia House in 1863 for West Jersey Railroad executive John C. Bullitt. During the next decade he designed numerous cottages and hotels in Cape May and the wooden summer city by the sea fell in love with his classical style. By 1878, Stephen Button was no longer in demand by a fashion-conscious leisure class that preferred younger, more progressive architects like Richard Morris Hunt, a favorite of the Vanderbilt family. The fire represented an opportunity for the aging architect. It became immediately clear, with few exceptions, Cape May would rebuild itself as a smaller, scaled-down version of its pre-fire era. The northern end of the Congress Hall property was subdivided. A new street, Congress Place, was cut through the property and cottage lots were sold. Congress Hall was rebuilt as a smaller version of the great hotel. Brick was used in its construction to advertise that it was modern and fireproof but the hotel was constructed in the traditional L-shaped style, that provided an ocean view for the maximum number of rooms. Although Button was not the architect for the new Congress Hall, he was later hired in 1880 to make improvements to the structure. Button designed the Joseph Evans cottage on one of the new Congress Place lots (205 Congress Place) in his classical style. He received two commissions; the first to design a new oceanfront hotel, the Windsor, and the second, a commission for Victor Denizot’s Lafayette Hotel, located at Ocean Street and Beach Drive. The two new hotels that Button designed mimicked the traditional seaside hotel popular thirty years earlier. Because the majority of the cottages built after the fire were constructed without architectural plans, it was common for carpenters to follow the lines of existing cottages or lift designs from the popular pattern books, collections of Victorian homes of varying costs and styles. In the case of Cape May, most were styled after the simply-ornamented Italianate “Button” style that the resort had fallen in love with decades before the fire. The property owners of Cape May were presented with a blank canvas after the rubble of the 1878 fire was carted away. Their decision not to compete with the more popular resorts limited the town’s growth but it fortunately preserved the intimate character of the town that so many value today. Vacationers seeking excitement chose Atlantic City. Those wishing to demonstrate to the world that they had “arrived” traveled to Newport, but the nineteenth century sojourner in search of a “health-giving” seabath still preferred Cape May. The beach became the engine that would drive the growth of the area destroyed by the fire. The “burned area” was too close to the Atlantic to remain undeveloped for long. The boardwalk was repaired to extend from Broadway to Madison Avenue. 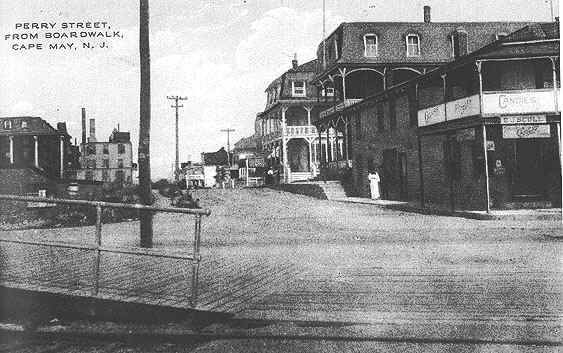 By 1880, Beach Drive and the Boardwalk were illuminated with gas lamps purchased by the city from the Pennsylvania Globe Gas Light Company. The lights were placed at equal distances, seventy paces, along the entire length of the boardwalk.